Ransom VirusesÂ made to look like legitimate applications! Ransomware viruses (also known as ransomware) is one of the fastest growing classes of malicious software. A few years ago they were simply just screen blockers such as the FBI virus fast forward to today and we have ransom viruses like Cryptolocker, Cryptodefense and Cryptowall. Whatâ€™s changed over the past few years? In the beginning we viruses such as the FBI virus we simply saw a screen lock. A screen lock is when you boot up your computer you see the virus and it takes control of the machine. It does so by allowing you to do nothing except power down the machine and boot up to the same locked screen again. This cycle quickly makes people desperate and they hope to gain access back to their computer by paying the ransom with a western union or green dot card payment. Today, we are seeing more complex and smarter versions of these viruses such as cryptowall. 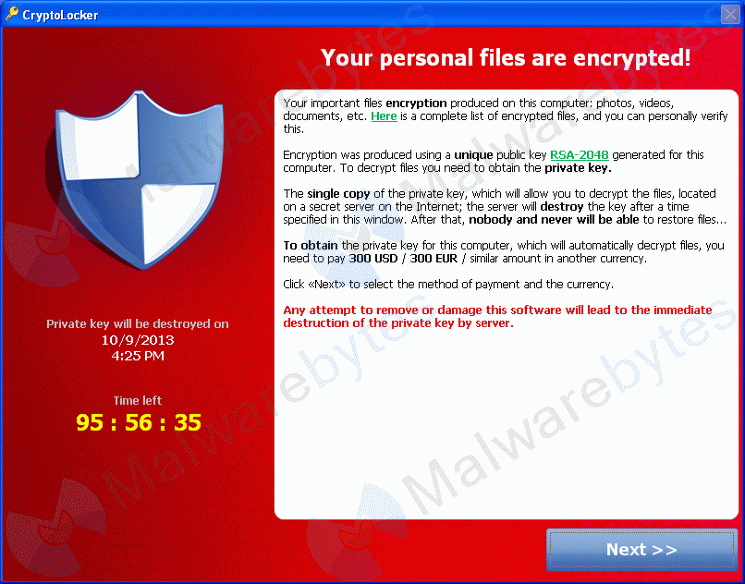 Cryptowall encrypts your data (ex. Photos, word docs, excel docs, some databases, etc.) and then demands ransom in the form of bit coins to get the decryption file to decrypt all of your data and get it back. You can see a more detailed post on Cryptowall here. What to do about ransom viruses? Keep your anti-virus program and definitions up-to-date. Donâ€™t open any e-mails from anyone you donâ€™t know and if you do then certainly donâ€™t download any attachments from that e-mail. Additionally, you can setup your anti-spam/email filter to filter out the email address update@microsoft.com or e-mails with the subject line Windows 10 Free Update. While these methods will help they arenâ€™t fool proof. We recommend Malwarebyte Pro or Business Edition to protect against or remove such ransom threats. Looking for help protecting against ransom viruses or just general anti-virus protection? Contact Us!